The Import Arguments dialog is used to copy the arguments used in installations in your target. 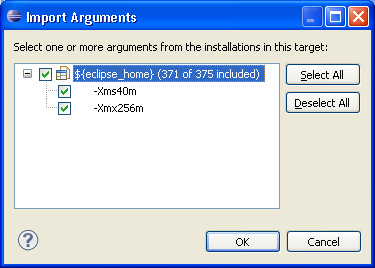 Often, if you have an Eclipse installation in your target that requires certain vm arguments to launch, you will require the same arguments to launch. This dialog is accessed using the Arguments Tab or the Environment Page. To have any arguments available for import, you must have at least one installation in your Locations that uses vm arguments in its configuration.